The 573G-74508G1Taii runs on Chrome OS Home Edition. The laptop features a 15.6 inch and is powered by a 1.8 GHz (3 GHz) processor. To enhance multi-tasking and fast speed, the company has offered a 8 GB DDR3 RAM. Talking about the storage, the laptop uses a 1 TB storage.The laptop has a 6 Cell battery that will give enough battery life to the users. 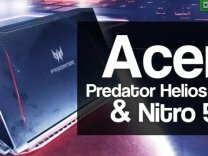 Acer has announced its all-new refreshed designed Nitro 5 gaming laptop, with improved specifications in a laser-textured design. Acer will recall 16,787 Gateway and Founder laptop chargers over fire risks, said the country's top quality watchdog on Wednesday. While the government is working towards empowering citizens digitally through the Digital India scheme, Karnataka Chief Minister Siddaramaiah has now announced that his state government body is now gifting free Acer laptops to qualified students in colleges. Under the hood, the Acer Swift 7 is powered by a powerful 7th Gen Intel Core i7 processor clubbed with 8GB LPDDR3 memory and 256 GB PCIe SSD storage.